Fatima was plump and timid, dressed in a brightly colored jilaba and mismatched headscarf. She did not speak English, nor we Arabic, but her smile was the glowy kind that only the kindest souls possess and she communicated by gesturing at the tray in her hand. She was asking if we’d like a cup of tea. Desperate for caffeine, we nodded and smiled back at her. She set two tiny, elaborately painted glasses on the tray, lifted a worn, silver teapot high into the air and poured with expert precision while the foot-long reach of tea miraculously landed in the cups beneath a layer of bubbly foam. Over the course of the next three months, we would see this ritual performed time and again, but this was our first and she had us captivated. The tea was deliciously sweet. That first time all I tasted was the sugar, which chased away the jet lag as it coursed through my veins. We had been warned off drinking the tap water here in Morocco, but we had also been warned against declining an offer of tea. 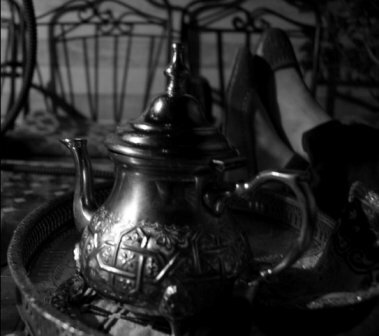 The ceremonial serving of sweet, mint tea holds the essence of the Moroccan culture of hospitality. Gunpowder green tea arrived in Morocco in the 1800’s from Europe. Since then, Moroccans have made it their own using generous amounts of mint and sugar. The gunpowder green is rinsed with boiling water, re-boiled with a handful of mint sprigs, and three spoons of sugar for every spoon of tea. Once the pot boils, three to five cups are poured then dumped back into the pot to stir the flavors before it is poured and served from high above, the height of the pour giving it its signature layer of foam. Because Morocco is a Muslim culture, the majority of public bars cater to tourists. Day drinking, however, takes on a different meaning as a significant part of local café culture in Morocco. Men sit outside cafes, their chairs turned to face the busy streets, sipping cup after cup of the sweet tincture humorously referred to as, Berber whiskey. A large group of men sitting outside a sidewalk café might be unnerving to passerby were they aggressive and drinking real whiskey. As it is, the men are sober, good natured, and hospitable, albeit wired and full of life and energy. Mint tea in Morocco has its place in negotiations, business meetings, hotel hospitality, social interactions, and family occasions. It is a tool in the negotiations of beautiful, richly colored rugs and blankets. It complements a meal of kefta or a spicy tagine. It is the supreme pick-me-up after a day of tourist sightseeing. This continuous overdose of caffeine and sugar among Moroccans and tourists may explain the stimulating energy in the medinas of Marrakech and Fez. The bustling centers are host to vendors selling an array of fruits, nuts, spices, oils, clothing, and trinkets. These vendors are vibrant people dancing through the ancient alleyways waving scarves for sale and tirelessly crafting in their shops, no doubt fueled by the mint tea that is constantly flowing in each stall. These vendors will not hesitate to share their tea and hospitality with serious customers while negotiations ensue. It is a lively atmosphere, though the sensory overload can be quite exhausting. Best to stop for a rejuvenating cup of tea one you’ve escaped the maze of the medina. Moroccan hospitality extends beyond the big cities and the villages into the great desert. While traveling through the rolling dunes of the Sahara, myself and four travel companions were waved down and invited into a Berber tent by a nomad and his young sons. There was no one else for miles; in fact we could see nothing but sand all around us. Likely the man was starved for company and he engaged my French speaking Canadian friends in the formal language of Morocco. I’m not sure what was said, but he created a jovial and hospitable environment, serving tea while his sons peeked in at their visitors. The experience of sipping tea while sitting on colorful, overlapping rugs that lay atop the soft sand of the Sahara, the fabric of the tent blowing in the hot breeze above, was surreal. I have had mint tea with vendors in the medinas of Marrakech and Fez, in Berber tents in the middle of the Sahara Desert, in little cafes and shops on the road that winds over the Atlas Mountains. I have even sipped the brew while negotiating camels for my hand in marriage. But I have never had sweet, Moroccan mint tea outside of Morocco. I think it would lose its charm. Indeed the ritual, the people, the sounds, the bright colors, and spicy smells of the country are all part of the taste and tea itself. Sensory overload in all the best ways! Thanks for the note! Never made it to Morocco…maybe some day…it sounds lovely. Sounds so exotic. I LOVE the Moroccan architecture. And sounds like I’d love the tea. Exotic is a great word to describe Morocco, I also use the word enchanting a lot when I’m talking about my time there. Such a special place. Thanks for introducing me to this lovely ritual. I think you are correct: some things can only exist in a certain time and place. Trying to recreate something like this tea anywhere else would never be the same. You make this sound like a lovely place to visit. Thank you. I really love reading things that take me to other places. You did such a fabulous job linking informational aspects with the kinds of details that really bring us there. While I studied abroad in England, I took a day and went to the Tea and Coffee museum and learned tons (that I later forgot) about history and culture and loved the connection that something as simple as fixing tea can have. Tea certainly has a place in history! I love that the culture and rituals around tea are different everywhere I travel. I went to Morocco with my family a few years ago, and your lovely description brought back a lot of memories for me. I loved having the mint tea at each new place as we arrived. What a lovely ritual! Your words really brought Morocco alive for me. I’ll add it to my must-visit list! Sounds like you had a wonderful adventure. Isn’t it amazing how such a simple thing can seem so much more intense when traveling – it tastes better, sweeter. And then you have those memories…. Fascinating – I had no idea! Oh, I loved this! It’s so fascinating how emotion, tradition, and comfort can all be embodied by a drink.